A wooden fence can be an outstanding addition to any home, especially when built with quality by the best local Peekskill fence contractor around. They’re affordable. They look nice. And they serve a valuable purpose of keeping intruders out and residents in. The only problem is that in due time, sometimes sooner rather than later, wooden fences tend to get a bit tired. Who can blame them? They have to endure years of elemental abuse. But that doesn’t mean that they’re doomed to fatigue. That just means they need a big of a touch up every so often. And we’re here to tell you how to do it. Here’s your guide from experts on how to return that beautiful wooden fence back to looking like it’s glorious original self. Let’s make your fence feel young again! Like any long day in the mud, or in your fence’s case, a long several months to years in the mud, there comes a point where we all need to just stand under a fountain of water for a bit and shed ourselves of all that built up gunk. You wouldn’t believe the difference you can make with a hose and maybe a bit of of scrubbing in the extra dirty spots. 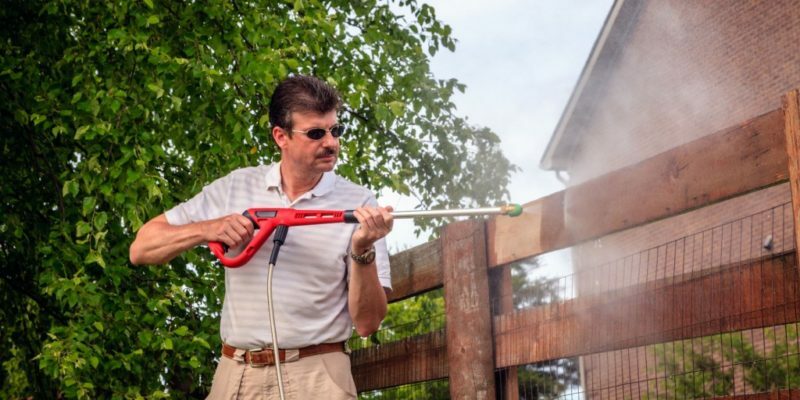 By washing your fence, you’re not only removing the dirt, but you’ll also be removing a layer of weathered fence cells that have overstayed their welcome. It’s time to welcome the next generation. The best way to get the job done right is with a power washer. This will cut out hours of manual labor and transform it into a quick and easy fix. The cost for a power washing machine that you connect to your hose can run you anywhere between $80 or less to being over $300. Shop at your own risk. Try gauge how often you’ll be needing it when determining how much you’re willing to spend. It’s time to stop ignoring those glaring damages that have lingered for all too long and have no plans over disappearing on their own. Nope. This one’s on you. Time to get out the glue and seal up the cracks. The longer you wait, the wider they’ll get, and the more of a hassle it will be to repair them. You can also grab a hammer and some nails to help seal up the bigger holes. Now comes the fun part. Grab a roller and some stain and polyurethane. You should roll about 3 feet’s worth of fence with a semitransparent stain. Then grab the brush to wipe off any drip before it dries. Now that it’s summer, you should be extra vigilant about drying paint or stain. Repeat that until the whole fence is rolled and brushed to perfection. Then, kick and observe. Voilà! Just like new. You can keep your fence looking brand new, but first, you have to get the fence. If you’ve been dreaming of getting the perfect wooden fence installed, now’s the time to make those dreams come true. Contact Quality Best Fence, the Peekskill fence contractor known to deliver. They can be reached by calling 914-737-8700 today.